Turns out that Mazatlán’s annual fireworks show, put on when Raúl Rico is head of CULTURA by Lux Pirotecnia (Jorge Márquez) of Mexico City, involves not only Canadians but a German expert as well. Want to know the story? Mike Toth, the gentleman I interviewed, works for Big Bang Fireworks out of Calgary, one of Canada’s top five fireworks outfits, owned by Dan Roy. Mike’s pyrotechnic journey started out like many of us; he lit off backyard fireworks that gradually gained in size and grandeur. Eventually he had to take a one-day safety course and become licensed. That was ten years ago, and he’s been learning on the job ever since. In Canada his fireworks job is pretty much May through September, plus Christmas and New Year’s. He tells me the crew here are like brothers to him; they have a whole lot of fun together. They stay in touch throughout the year on WhatsApp and Facebook, despite huge language and culture differences. Two of the crew, Mauricio and Ramses, speak English (as do the three team leads), but most do not. Rodrigo comes from Durango: he’s a cowboy through and through, and César is evidently quite the comedian. Mike shared a few snapshots of his visit with me, below. Click on any photo to enlarge it or view a slideshow. Mike’s technically not down here in Mazatlán working, but rather on vacation—hanging out with the pyrotechnists who are. But he did bring down with him a bunch of equipment: $40,000 worth, more or less. He brought seven panels and even some modules. Why? Well, fireworks equipment is expensive, especially the computerized kind that syncs music and explosions. Thus, Lux and Big Bang often collaborate in order to pool their resources and put on bigger and better shows. Jorge (Lux) and Dan (Big Bang) are good friends; Jorge’s equipment often helps out during Canada Day (when Big Bang might have 30-40 shows in one day) or Edmonton Klondike Days (10 straight days of fireworks), and Dan’s equipment supplements shows in México during events on Constitution Day, Independence Day and Carnaval. I love fireworks, I’m all about collaboration, and this story is intercultural, so I find this trifecta of my passions very cool! How does a fireworks show—our Combate Naval, for example—come to be? Jorge designs the show and its accompanying music and scripts it on paper, indicating the type and size of each firework, it’s color combination and time delay. I’m sure CULTURA is involved in some way at the design phase, too, though of course Mike doesn’t know about that. The shells are fixed into a string of ten or so and then put carefully into mortar tubes. There is no wasted space. Inside is an electric match; when the button is pressed, it launches. Lux Pirotecnia is responsible for four major shows during Carnavál: the three coronations in the stadium, and the Combate Naval on Saturday night. I forgot to ask Mike about the crowning of the King of Joy. The fireworks are stored on a rancho just north of town. Combate Naval 2017, for the first time ever, involved five barges; this allowed us to see the fireworks closer than we would if shooting exclusively from a ship in the bay. To me it was a HUGE improvement in the show! Unfortunately, however, one barge flipped over before the show due to the heavy waves. We ended up seeing fireworks from four barges or platforms. The barges are first put into position, then the pyrotechnicians go out in small boats to wire them up and turn them on. There was also a ship out there—yes, a real ship. Mike tells me they set up what looked like a helicopter landing platform on the deck of the ship, and from there the fireworks are launched. The capsized barge was rescued after the show, though of course the fireworks were ruined. The main fireworks panel is just above where the Queen and the VIPs sit: at the Pedro Infante statue. All the music is precisely choreographed to each burst of the show, as we all know and so thoroughly enjoy each year—it’s computerization converting gunpowder into beauty for all our enjoyment. 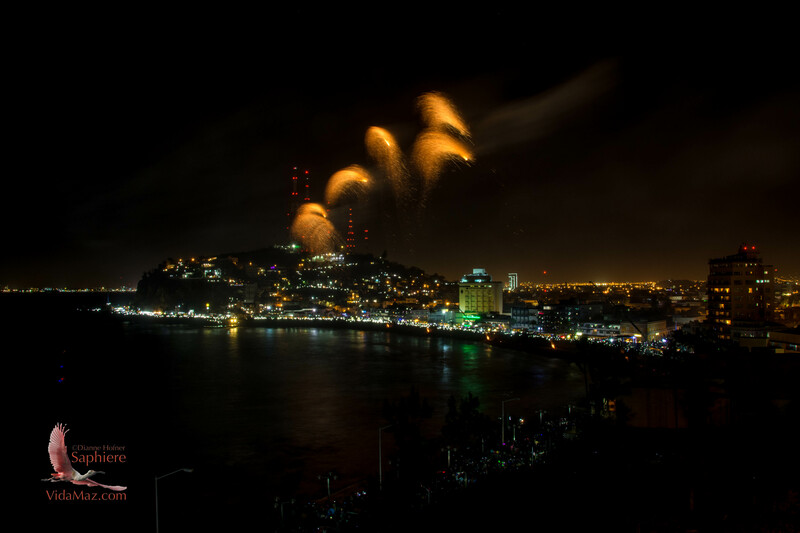 Just how many people are involved in Mazatlán’s Carnavál-related fireworks? There are the three bosses: Jorge, Juan and David, from Lux. There are ten shell crew members, and ten one-shot crew members. There are also three drivers: two trucks and one van. I get a total of 26 fireworks technicians involved in Carnavál. How much does such a show cost? Again, Mike doesn’t get involved in that, and he can only quote Canadian pricing, which averages $1000/minute. And where does the German connection come in? That would be Klaus Ulrich, the flame expert. If you attended any of the coronations in the stadium, you felt the heat as the flames reached from the front of the stage towards the sky. That was Klaus’ work. We also experienced the heat of Klaus’ flames from the barges in the bay during Combate Naval. Innovative round or wheel-shaped fireworks: crane wheels, with some of Klaus’ flames coming off two of the barges in the bay. Palm: Rising tail that bursts at the top with large tendrils. Weeping willow: long-burning stars in a dome-shaped, weeping willow-like arrangement. Aquatics: fireworks that fly into the water and then blow up. Mike says everyone has them. Jorge’s are 8-inch Kamuro shells: a dense burst of silver or gold stars that leave a glitter trail. Camaros: double dome-shaped weeping willow with twinkles that fall to the water or ground. Crane wheels: a one-shot wheel that can shoot sunbursts or a wheel shape. About one meter round, clamps to a plate. One set of fireworks is set at an angle to rotate the wheel, the others are set for the display. Fountains or Gerbs: a thick-walled tube with a narrowing in the tube that produces a long-lasting jet of sparks. We saw these in the stadium and during the Combate Naval. Horsetails: heavy long-burning fireworks in the shape of a horse tail that only travel a short distance from the shell burst before free-falling as glitter to the ground. They’re also known as a waterfall shell. Roman candles: long tubes containing several large stars which fire at regular intervals. This Carnavál they used roman candles up to 4 feet tall anchored to a wooden frame, mostly arranged in fan or crisscross shapes, at close proximity to the audience. We see these on the beach during Combate Naval, and also during the coronations. UFOs: one of my favorites of Combate Naval, the best way I can describe it is a spinning top that launches into the air, leaving a twirling vertical tail. Ours then burst at the top to result in a palm tree-like shape. Mike says that in Canada they usually use a round plastic frame, but here in México it’s bamboo. Bravo for México! Our UFOs had 4 herbs to push up and 4 to rotate. Below I share some of the terms Mike used during the course of our interview, in case you like getting inside the world of a pyrotechnist as much as I do. One-shot tubes: just like the name sounds. Cake: multiple tubes connected by a fuse. When connected they look like a box. Panels: the computerized panel of buttons that controls the show. He explained to me that a firework has a lift charge. The fuse wraps around a ball, and a couple of sticks are timed as fuses. That’s how they set timings. The pyrotechnicians can then launch a firework, it goes into the air with the lift charge, and in four seconds, or six, at the height of its trajectory, the secondary fuse sticks will fire and the effect will explode. We all know that here in México people build fireworks. They do so in the USA also. But Mike told me that in Canada it’s against the law to build fireworks! The country’s last firework maker was Hands Company. One of Mike’s dreams is to work in Lux’s shop in Mexico City for a few weeks, so he can have the experience of building fireworks. Another huge difference that stands out for Mike is, of course, safety. 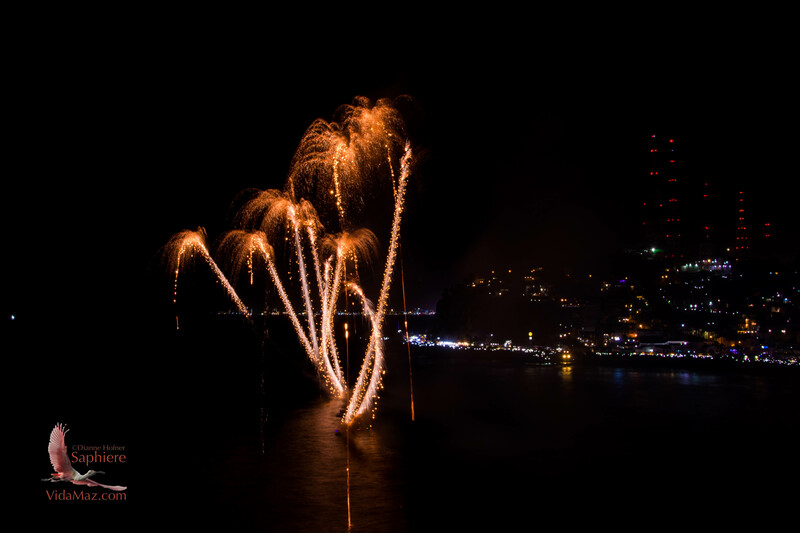 The hand-held bottle rockets that lead every parade in Mazatlán would never be permitted up north, nor would allowing people to sit so closely to the fireworks. He was amazed that people hang their legs off the malecón during the Combate Naval, for example, and loved hearing that people here consider ash burn lucky, just like bird poop. In Canada to launch fireworks you need insurance and permits (which I believe you need here in México as well, at least for the large ones), you have to launch on private property, and you can not shoot fireworks near a lake or river because it upsets the fish. I know fireworks are environmentally hazardous, but they definitely light up my soul. 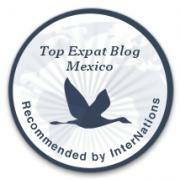 We love Juan José Ruiz of Mazatlán Fireworks, our local expert. He and his guys put on a beautiful 45-minute show for our wedding anniversary party that thrilled all the kids who got to push the buttons on the panel. Juan José tells me that his firm has often done Carnavál Fireworks, also, but that he tends to be asked to do them when the PRI is in charge of the government. I got hooked on fireworks as a child in Wisconsin, and deepened my love for them living for over a decade in Japan. 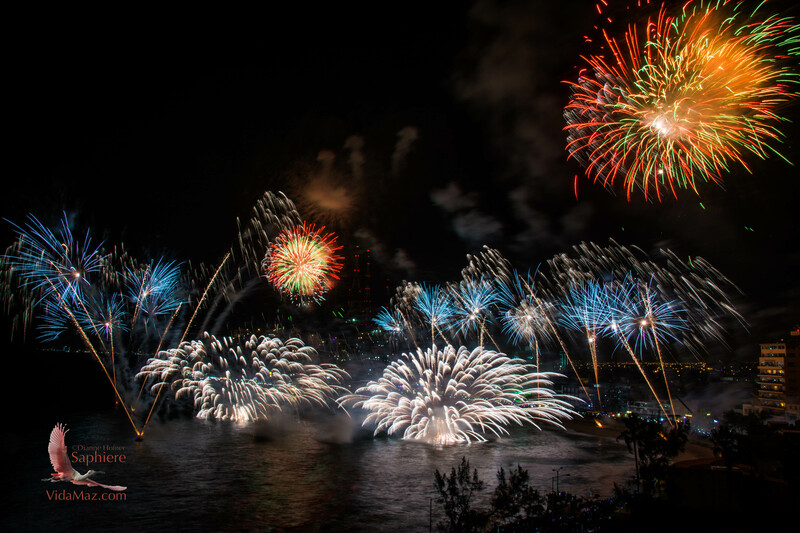 Mike told me about a couple of fireworks competitions that I need to add to my bucket list, including GlobalFest in Calgary and Montreal’s L’International des Feux Loto-Québec, the world’s biggest fireworks festival. During my research I also found the Tianguis de Pirotecnia San Pablito Tultepec, which is coming up March 4-11 right here in México—we all remember seeing video of the huge explosion in a warehouse there last December. Frequent winners of the international competitions are, of course, Disney, and also Zambelli Fireworks out of Pennsylvania. Next time you attend a fireworks show, stop and think about all of the people, time, preparation and work involved in delivering the performance you are enjoying. You just might find yourself appreciating the spectacle even more!